Powder Tech has a state of the art powder coating line to meet any requirement that you have. We are your one stop shop for metal finishing. Powder Tech has the ability to coat Steel, Aluminum, Magnesium and zinc substrates. With years of experience we service many industries which include automotive, agriculture, Electrical, and recreation industries. No run is too big, nor too small for us to finish! 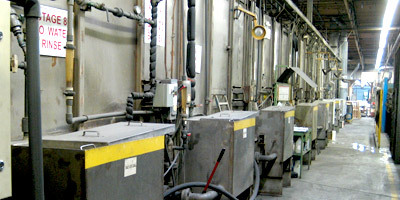 We have a 7 stage state of the art wash line, which allows us to meet the industries toughest standards. This line can handle parts up to 60" high x 24" wide x 96" long. We have met and exceeded the toughest standards set out by Toyota, Nissan, Chrysler, Ford, GM, and Bombardier. We are one of the few powder coating companies that use alodine 5200 for the pre-treatment of aluminum substrates.